as in an empty station when the trains are parked off somewhere else, asleep. “What is wrong?” She asked me with trepidation in her voice. Perhaps it was the distraught look on my face or the pool of tears that instantly welled up in my eyes. Either way, she knew that I had just received some bad news. I struggled to hold it in, to reign in my emotions, afraid that if I let myself cry, I would never stop. I got off the phone with my husband and pulled myself up to a sitting position in my hospital bed. “My grandmother!” I exclaimed through bouts of broken breaths. I did not need to say more; she understood. She came over to where I sat and gave me a hug. She enveloped me, and I simply clung on. I managed to calm myself down and when I was ready, she sat with me. My only grandmother was gone… Dani, my direct connection to my roots, was. no. more. Reality refused to sink in. I started to bargain with God. Lord, if you only let it not be true then I will do whatever you need. I got angry. Why would this happen to our family, especially at a time like this? I even experienced hope. I expected my phone to ring anytime and for me to hear that everyone was mistaken, that she was alive and well…the phone never rang. All the regrets and wasted time flooded my mind. I knew she was old, but she had always been there, a permanent fixture. Dani was always there as long as I could remember, she always looked the same, never changing, never looking old, but still old because of the passage of time. I cursed time. I cursed the distance, and I cursed my inability to do anything meaningful. I felt powerless. She never met my husband; she never met my daughter; I never said goodbye. My friend sat there and simply listened. She knew because she had also lost her beloved grandmother. In the hours to come, my friend and I talked about our grandmothers. She showed me a picture of her beautiful and regal looking grandmother. We celebrated their lives through our memories. By the time she left my hospital room, I was calm and ready to face my reality. Then the night came and with it. My memories and sadness resurfaced. I cried all night and the next day, and the next. The nurses who came to my room reassured me that all would be alright. I could tell they wanted to do more, but felt powerless. Sometimes I smiled, sometimes I cried. They did not interrupt, they just let me be, and let me know that they were there if I needed anything. Grief is a strange beast. The stages are random and they can occur at anytime. If you are reading this entry hoping for wisdom and insight, I am sorry, there is none from me. I just needed to see my thoughts written on paper, to make sense of and cement my loss. I have to accept and believe that things will work out. We each have a purpose to fulfill in this life, and my Dani had simply fulfilled her life’s journey. She may not have lived a lavish and lush life, but she lived a long time. A child of the 20’s in the harsh conditions of Africa, she lived through some things. My hope is that she has found her way through the maze of eternal life. I look forward to being reunited with her when God calls me home, then perhaps I would be able to tell her all that I wanted to say. As for me, my heart is still broken and I am still patiently waiting for acceptance. 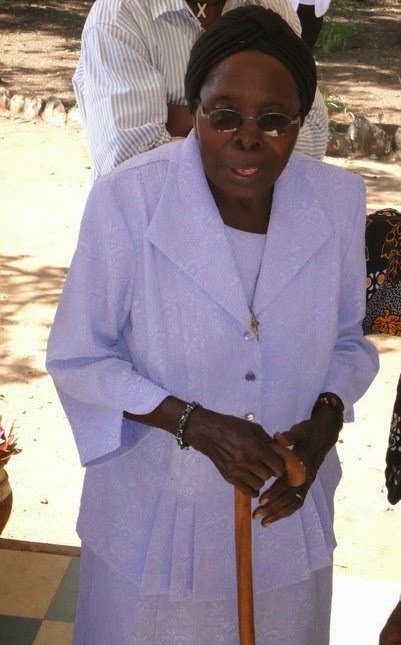 Rest in Love Getruda Kipande Okello, my Dani. Until we meet again.